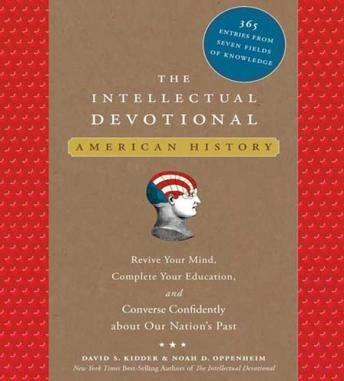 Modeled after those bedside books of prayer and contemplation that millions turn to for daily spiritual guidance and growth, the national bestseller The Intellectual Devotional-offering secular wisdom and cerebral nourishment-drew a year's worth of readings from seven different fields of knowledge. In this follow-up volume, authors David S. Kidder and Noah D. Oppenheim have turned to the rich legacy of American history for their selections. From Thomas Jefferson and Benjamin Franklin to Martin Luther King Jr., from the Federalist Papers to Watergate, the giant figures, cultural touchstones, and pivotal events in our national heritage provide a bountiful source of reflection and education that will refresh knowledge, revitalize the mind, and open new horizons of intellectual discovery.